Regular ambient temperature monitoring provides data used to help calibrate thermal imaging videos as part of research into measuring stress levels in wild birds. 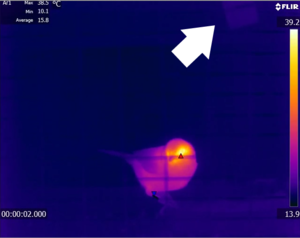 Researchers at Glasgow University are developing a new, non-invasive method of measuring stress in wild birds using thermal imaging. This new technique avoids the difficulties of having to take blood samples to look at plasma hormone levels. When animals are under physiological stress, their blood gets diverted to the body core. This results in a cooling at the skin surface, which is what the researchers are studying as a new way of assessing stress state. The absolute temperatures measured by the thermal imaging cameras are affected by a number of factors, including air temperature and humidity. The analysis software is designed for this data to be inputted, but in practical terms it is inconvenient to collect, and can introduce error. An alternative method is to provide a reference temperature from a body with known reflectance, within the field of view, against which the whole image can be calibrated. A Tinytag temperature probe covered in insulation tape is perfect for this job. Loggers and accompanying probes are being used in this way with cameras at a number of research sites in the area surrounding the Scottish Centre for Ecology and the Natural Environment (the University of Glasgow field station), on the eastern bank of Loch Lomond. Paul Jerem is a Researcher on the project whose group has been using Tinytag loggers to successfully monitor ambient temperature for many years. Paul comments, "As the loggers were already providing the kind of data we needed for calibrating the thermal image videos, it was suggested that I use them. Their accuracy and the ease of use of the software are the main reasons I'm happy using them." In order to increase stress levels in the birds, a stuffed sparrowhawk is sent down a length of clothes line, picking up speed as it approaches a busy woodland bird table, simulating a natural attack. The thermal cameras record changes in bird body temperatures as the perceived risk of predator attack rises. The study aims to understand how animals are responding to environmental change, particularly climate change. The arrow on thermal image above shows the logger probe in the top right hand corner (the slightly pale rectangle).